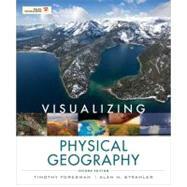 , by Foresman, Timothy W.; Strahler, Alan H.
With its unique approach, this second edition captures the reader's attention and demonstrates why physical geography is relevant to them. It relies heavily on the integration of National Geographic and other visuals with narrative to explore key concepts. New emphasis is placed on environmental issues, such as climate change, overpopulation and deforestation, from a geographical perspective. Readers will appreciate this approach because it vividly illustrates the interconnectedness of physical processes that weave together to create our planet's dynamic surface and atmosphere.